These photo's show a mixture of masters in brass and plasticard, and cast resin parts, in the end I hope to produce this as an aid to scratchbuilding type kit however there are still a few areas that I dont have detail photo's of, notably the area of the underframe between the bogies, and the equipment that is under the middle segment of the jib in the first photo. 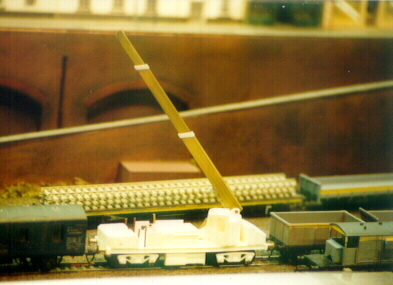 Ive now got most of the details sorted, this is the unpainted crane on my clubs layout 'Central', unfortunately the bare resin dosnt give enought contrast, I will take some more photo's when I've primered it. Return to Jon's model page.